Over two years, Anne and Mo travelled around British Columbia scouting out filming locations from the re-imaged Battlestar Galactica (2003-2009). It's an amazing feeling to walk into an area that you suddenly know, even though you've never been there before. It's a bit like walking onto the set of the show! We've had numerous requests from other fans for help with their own trips, so we put together this site to help you plan your own locations trip and/or take a virtual trip to the sites! Click to enlarge photos and see descriptions. Prints of the beautiful photo on the left are available at Dennys Ilic's Red Bubble page. Yes, I walked into the reflecting pool at the academic quadrangle at Simon Fraser University! 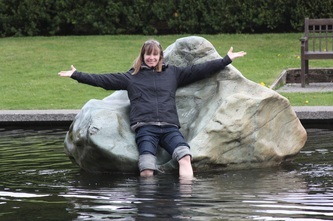 At that time, May 2010, there was no algae or koi in the water, and it was ridiculously cold, but very clean. We were there on a Friday afternoon, so there were virtually no students on campus. In 2011, the algae and koi were back, causing Anne to rethink her own wading plans, and we walked into a film shoot for Underworld 4! Check out our behind-the-scenes section for photos and stories from the sets and locations of BSG. Also, Maurice Woodworth, set dresser for numerous episodes of Battlestar Galactica, kindly granted us permission to use his amazing behind-the-scenes photography for the site. Look for his photos under 'Razor' and in the episode listings for 'Colonial Day,' 'Kobol's Last Gleaming I and II,' 'Revelations,' 'Sometimes a Great Notion,' and more! Use the drop down menus at the top of the page to search the guide using episode/movie screen captures. Alternately, you can jump right to the locations guide and read the instructions for navigating the guide directly. You can read about the authors of this site on our about us page. You'll find downloadable files, such as a Google Earth KMZ file of all public locations, on the trip resources page, and links to other web resources on our links page. We did our best, but in two weeklong trips we were not able to visit every location. If you have photos and/or stories about any location, whether it be one we haven't visited or an update for one we have, we would love to hear from you! We also have a page dedicated to fans called Your Trips, and we're always looking for new photos to add. Use the contact form on our about us page to send us an email.